Searching for letter formats? We howtoletter realized your need and thus come up with several types of sample letters and format of letters. Dig into the website and grab what you want. Are you thinking of writing a letter to municipality to curb (drive away) from your area ? Then the letter format illustrated below will help you. Take this format as model letter and write your letter in a meaningful way. 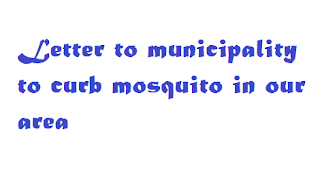 Subject: Regarding eradication of mosquito population. I am a resident of ward no 4 of patancheru. I would like to bring to your notice about the problem of growing mosquito population in our area. Mosquitoes are the carriers and root cause of many diseases. There has been a huge growth of mosquito population in our area in recent areas. Due to this many diseases like malaria are widely spreading among residents of our area. Especially children were much affected due to these diseases. Garbage dumps in our area were not being removed regularly. There are many man holes which are left unattended for long time causing them to overflow on to the roads in this rainy season. This leads to growth of mosquito population in stagnant drainage water. We haven’t received any measures taken by municipality like mosquito gas to curb mosquitoes from past 2 years. Hereby, I request the concerned authorities to look in to the issue and take necessary action as soon as possible. Note: Make necessary changes in appropriate places in the format given above. We are runnning this website for internet users who are searching for how to write letters on different situations. Feel free to commect is through our social platforms provided below.